The Honda TT Legends team finished its debut Bol d’Or in an impressive fifth place after a gruelling 24-hour race that saw John McGuinness, Steve Plater and Keith Amor complete 796 laps of the Magny-Cours circuit, France. The event was the first round of the 2011 FIM Endurance World Championship, which the team will contest along with the Isle of Man TT and the Ulster GP. 15-times TT race winner McGuinness started the race for the all-new team from seventh on the grid. His steady and conservative first laps set the tone for the rest of the race as each rider headed out onto the circuit for their individual stints with focus and determination. The team remained in seventh position for the first section, battling in close contention with four other teams – including private French Honda team National Motos. A dramatic turn of events came with the break of dawn as the Yamaha Endurance Racing Team retired due to a technical problem and National Motos suffered a brake problem forcing them back two laps. This elevated the Honda TT Legends into fifth place where they remained steady for the rest of the race, eventually finishing 18 laps behind the winning team to achieve their aim of finishing the 75th annual Bol d’Or. 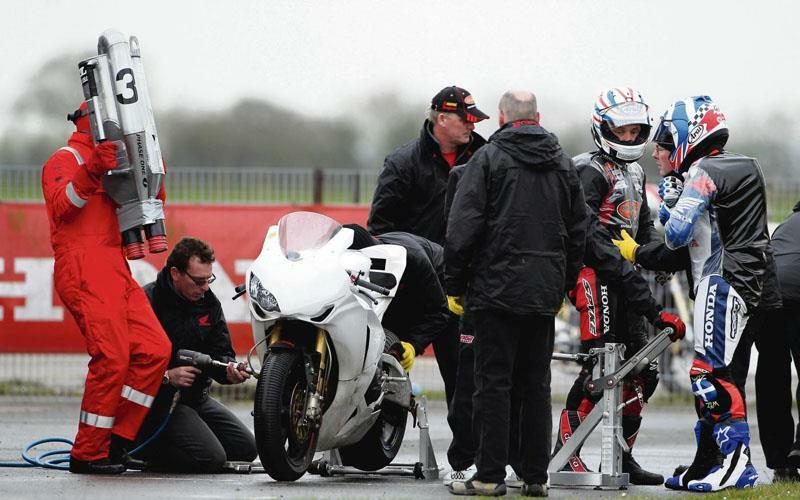 Keith Amor completed the final stint to bring the Fireblade past the chequered flag. “I’m pretty happy with that to be honest. It’s strange really because we were so close to the podium and it would have been great to get there, but we’ve got to be realistic with ourselves. We’re a brand new team and top five at world level in the first championship race is absolutely brilliant. “The whole team has put in a massive effort and worked really hard to get ready for the Bol d’Or. It’s a very hard, steep learning curve to do a 24-hour first rather than a six or an eight-hour. “Right now I’m feeling relief, just massive relief. That was a tough race for me, it was really, really hard. The most important thing for me at the end there was to bring the bike over the finish line. “I’m so happy for everybody in the team. Endurance racing more than any other event is a team effort and everyone has played their part tremendously. “Any successful result is a team effort and on this occasion the team have performed splendidly. Considering it’s the first event of the year and the hardest event of the year, fifth place is beyond all our expectations.